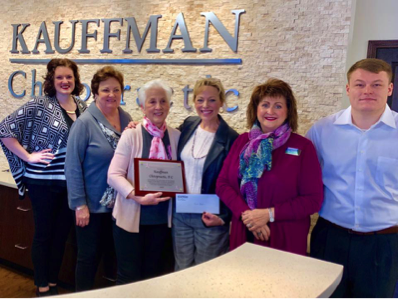 Each year, businesses in our community hold fundraisers in support of Breast Cancer Awareness Month and making Pink Ribbon Society the recipient of the funds they raise. For the third consecutive year, the Strack and Van Til and Town and County stores in our community held a Check Out Challenge supporting the programs and services of Pink Ribbon Society. From October 1 – October 14, 2018 Strack and Van Til and Town & County employees asked their customers to “Round Up” to support breast cancer and they did…..in just two short weeks, they raised $ 46,177.00. This brings the Check Out Challenge to a total of over $ 135,000 over the past three years. Pictured: Left to right: Joe Battistoni, General Manager/Vice President of Sales & Marketing The Times; Barbara Werblo, committee member of Pink Ribbon Society; Ann Peters, Founder & President Pink Ribbon Society; Maura Rowley, Secretary/Treasurer Pink Ribbon Society; and Dave Wilkinson, President Strack & Van Til.Also shown are three of the top four fundraising cashiers, Debbie Scott, SVT Crown Point Franciscan Drive; Hunter Johnson, SVT Chesterton; Jessica Sherrod, SVT Munster; not shown is Jocellyn Theiling, SVT Cashier Valparaiso South. Far right is James Pellegrini, Marketing Manager The Times. This is the 7th year the Ladies have supported Pink Ribbon through their annual outing for breast cancer. To date, they have donated over $ 36,000. 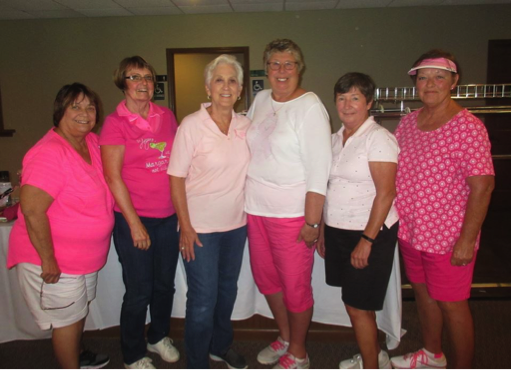 Shown in the photo are from left to right, Rose Colbert, Judy Alliss, Ann Peters, SSLGL President Mary Lou Thompson, Kathy Ebert and Peach Early. 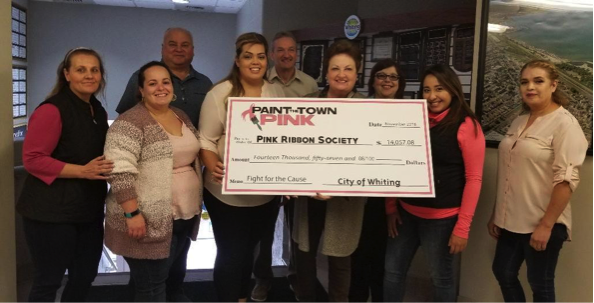 The City of Whiting held their annual Paint The Town Pink event in May. 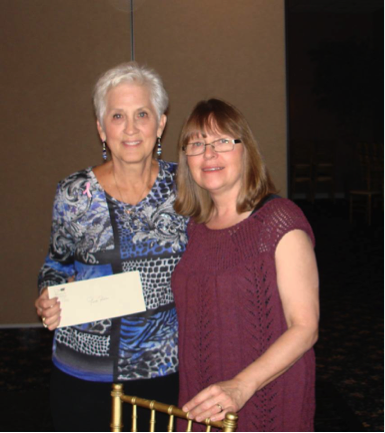 They are shown presenting a check in the amount of $ 14, to Pink Ribbon Society Secretary Treasurer, Maura Rowley. Shown are front from left to right are: Ann Canning, Lora Cairo, Leslie Flores, Diane Kaminsky, Alexa Cano, Evelia Garcia – Back: Mayor Joe Stahura, Clerk Treasurer John Haynes. Kauffman Chiropractic in Crown Point and Merrillville have been ongoing supporters for many years. 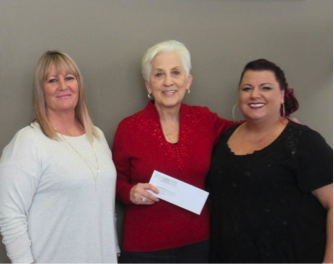 With their contribution this year in the amount of $ 2,500, they have donated a total of over $ 20,000 to support the programs provided by Pink Ribbon Society. Shown from left to right are: Amanda Mattox, Maura Rowley, Ann Peters, Dr Danielle Kauffman, Jean Chappel and Bradley Ott. Paula Strietelmeier, her staff and customers of Sheep’s Clothing in Valparaiso, have been knitting and crocheting to benefit Pink Ribbon for over a decade. Each year, they present a style show and auction of styles that they have knitted and crocheted themselves. To date, Sheep’s Clothing has donated over $ 18,000. 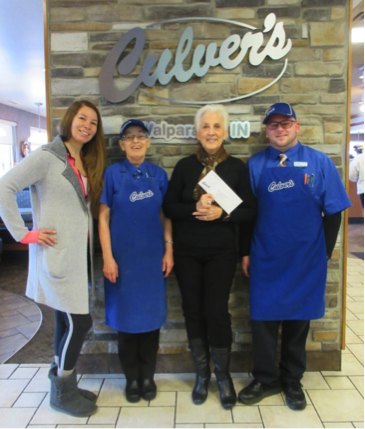 Culvers of Valparaiso has been an ongoing supporter of Pink Ribbon for the last three years. They have been our sponsor at the annual Popcorn Festival as well as a full month of fundraising during the month of October. To date, Culvers has donated over $ 8,000 to support the men and women of our community whose lives have been touched by breast cancer. Show below are Ashley Crouch, Ann Peters and Dustin Pickley. Vanis Salon and Day Spa in Valparaiso, held a Cut-A-Thon making Pink Ribbon the recipient of the funds raised during this event. They donated $ 2,190 raised during the special event. Show with Ann Peters are Debi Schweda and Jen Bunk. 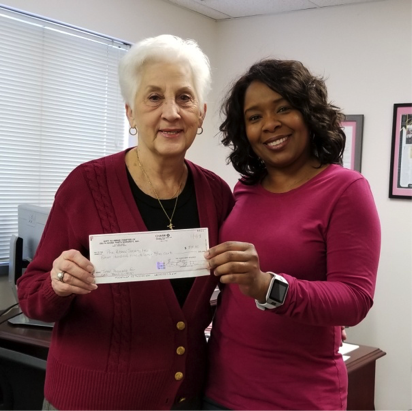 GAC Physical & Mental Health Chairperson, Shalonda Hall presents a check in the amount of $ 809 to Ann Peters of The Pink Ribbon Society. The money was raised through a recent GAC Bowl-a-thon held by the group. 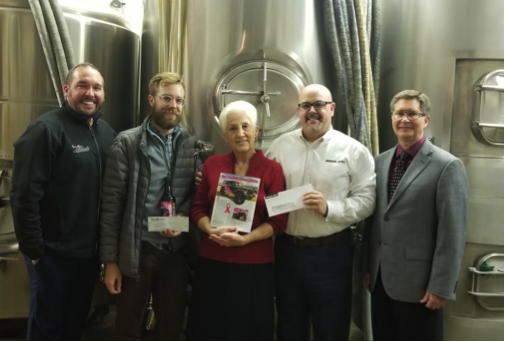 Andy Tylka of Tom and Eds Autobody & Towing Inc, Zack Bryan of Crown Brewing, John Schultheis and Skip Bosak from Bosak Motors, presented Ann Peters with contributions of over $ 500 from a recent Jeep/BCB collaboration. Other fundraisers held but not shown include, Anytime Fitness, Fegley Elementary School and GFWC St. John’s Women’s Club.